Without An Inner envelope, How Do I Properly Invite Guests And Children? Though traditional wedding invitation etiquette calls for the use of properly addressed inner and outer envelopes – pocket invitations are anything but traditional, and they certainly do not require inner envelopes. 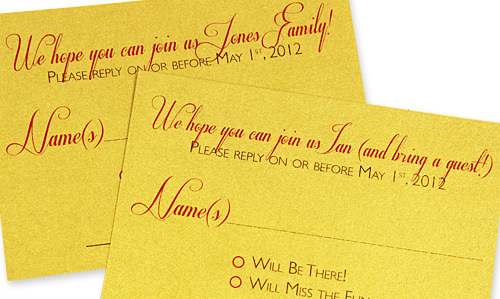 In this post, we’ll give you ideas for addressing your pocket invitations without inner envelopes. Like pocket invitations, our addressing tips would not be considered traditional, but are proper, and clearly indicate exactly who is invited to your big event. What’s a Double Wedding Envelope? Why Aren’t Double Envelopes Necessary for Pocket Invitations? Pocket invitations are contemporary. 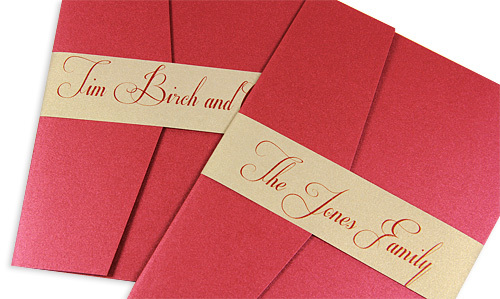 Double wedding envelopes are typically reserved for traditional style invitations. Housing and organizing the invitation components, the pocket acts as an inner envelope in and of itself. So there you have it – if you’re making modern pocket invitations, lighten up! Nix the inner envelope and use just an outer mailing envelope. But herein lies the next problem. . . Without an Inner Envelope, Where Do I Include Guests & Kids? 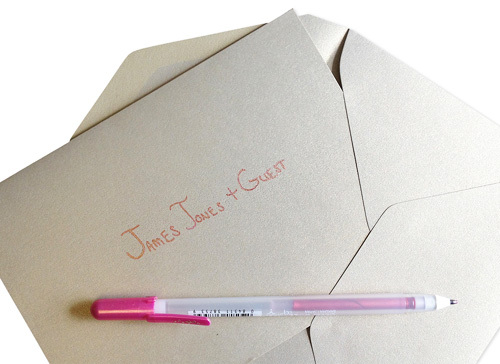 Since traditional invitation etiquette suggests that the formal mailing address goes on the outer envelope and the informal address – James Jones and Guest, or James Jones and Timmy, Tommy, and Susie – goes on the inner, people very commonly ask how to indicate that guests and kids are invited if there is no inner envelope. This is a great question and a valid point to make, but it is not one to get worked up over! 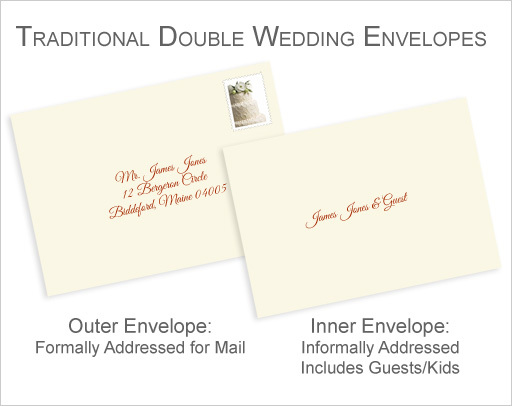 In this modern day many people still use double wedding envelopes, but an increasing number do not. 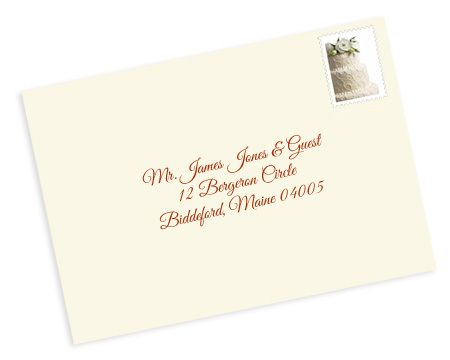 Even without the use of an inner envelope and traditional wedding etiquette, there are several ways to properly address your envelopes and to indicate that guests or kids are invited, which we discuss below. The easiest way to include guests and kids is just to include them on the outer mailing envelope. 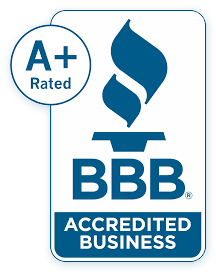 For example, Mr. James Jones and Guest, or Mr. and Mrs. James Jones and Family. It’s formal, it’s proper, it’s easy for you, and it’s the clearest way for your guests to see that their significant other or children are invited to your event even before they open the envelope – no questions asked. 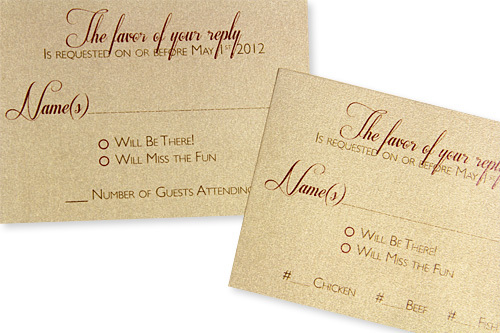 Another option is to use the reply card to indicate that guests or kids are invited. There are two ways to do this, both of which can be done on their own, or in conjunction with including guests and kids on the outer envelope. When designing your reply cards, alert guests to the fact that they may bring a guest by adding a ___ Number Attending line in addition to a Name(s)___ line. Requesting a number next to the entree choices serves the same purpose – for example, ___ #chicken, ___ #beef. Recommendation: To avoid any confusion, we recommend including guests and kids on the outer envelope as well. Instead of a generic, The favor of your reply is requested on or before, consider personalizing your reply cards to include the names of those invited. For example, We hope you can join us Jones Family!, or, We can’t wait to celebrate with you James (and bring a guest)! Since pockets serve as inner envelopes, you can treat them like inner envelopes and write the informal address right on them. Write the address on the side of the pocket without the flap, and place it in the envelope so that the address is seen when the pocket is removed from the envelope. Gelly Roll Pens and Calligraphy Markers work well for writing on pockets. Instead of writing directly on the pocket, you may choose to include guests and kids on a printed paper belly band or a tag that is wrapped around the pocket. Again, this would be done using a data merge program.